A celebration of bold flavors can be found in the festive dishes of the Gulf. Follow along step by step, as Martha teaches you the tricks to cooking these customary dishes: chicken machbous, al mansaf, beef biryani, and lamb ghouzi. You and your guests are sure to celebrate each delicious bite! 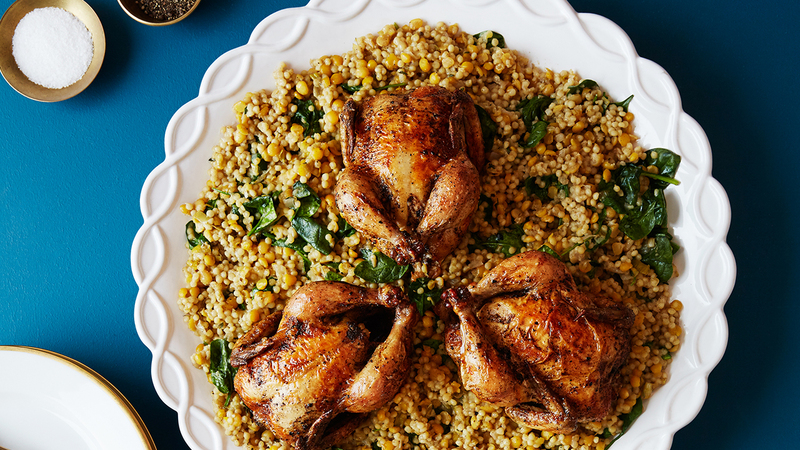 This chicken makbous recipe appears in the "Festive Occasions" episode of Martha Stewart's Cooking School. Make the Cornish game hens: Preheat oven to 500 degrees (260 degrees C). In a large stockpot, bring stock, onions, garlic, peppercorns, cardamom, cloves, cinnamon sticks, bay leaves, 3 teaspoons salt, and 8 cups water to a simmer over medium-high heat. Season hens with salt and pepper and place into the simmering poaching liquid, adding more water, if necessary, to cover hens. Poach for 10 minutes. Using a slotted spoon, carefully remove hens from poaching liquid and place them breast-side up on a parchment-lined rimmed baking sheet fitted with a wire rack. Strain poaching liquid, reserving 5 cups for couscous. In a small bowl, stir to combine ghee, loumi, coriander, ground cinnamon, 1/2 teaspoon salt, and 1/4 teaspoon pepper. Brush ghee mixture all over the poached hens, then transfer to oven. Roast until skin is crisp and deep golden brown, about 8 minutes. Let rest 5 minutes before serving. Make the couscous: In a large straight-sided skillet, heat ghee over medium. Add garlic, leeks, onion, thyme, cumin, coriander, cinnamon, cardamom, and cayenne; season with salt and pepper. Cook, stirring occasionally, until vegetables are softened, 3 to 5 minutes. Stir in split peas and 5 cups reserved poaching liquid; bring to a simmer. Cook for 5 minutes, then stir in couscous and cook until al dente, about 15 minutes. Fold in spinach and season with salt and pepper. Halve hens through the breast and backbones, if desired. Spoon couscous onto a serving platter and top with hens.